Sāṁkhya Darśana is a traditional philosophical school of India that assume the existence of two eternal principles – the Nature or Material principle (Prakṛti) and the Spiritual or Soul (Puruṣa). The fundamental treatise Sāṁkhya Kārikā is written in the IV century AD by Īśvara Kṛṣṇa, when the Sānkhya system was on its zenith. However, it was not considered something original, because Sānkhya teachings have been around in India a long time before and it is considered that Buddha Shakyamuni himself was practicing under the guidance of Sānkhya teachers, before he reached enlightenment, long before. Sāṁkhya Karikas are rather summarizing all that have been before in this particular tradition of yoga. The work Sāṁkhya Karika has been held in high regard since then as a treatise of classical Indian philosophy and by its significance can be compared with such works as Yoga Sūtras by Patañjali or Brahma Sūtras in their respective traditions. There have been many commentaries on Sāṁkhya Karikas by renowned Indian panditas, scholars of their own tradition and other traditions and many references to it in works of teachers of other traditions like those of Buddhist and Vedanta traditions. Contrary to teachings of Vedanta and the first Sānkhya tradition mentioned in Mahabharata, Īśvara Kṛṣṇa taught that the reality is not singular but plural. On one hand there are countless and ever changing unconscious forms of nature (Prakṛti) and on the other hand – the incalculable amount of transcendent selves (Puruṣas), which are in essence the pure, omnipresent and eternal consciousness. The treatise is reflecting on the same old thesis – on first glance we can see that there are countless number of separate beings, which are born and die in different times, they may possess different qualities and thoughts and so on, but observing more closely we can find that the inner self of beings have many treats in common. Author of Sānkhya Karikas is distinguishing such a treats as ’being a passive witness’ (sākṣin), essentially isolated (kevala), neutrality ( madhyastha ) and being non-agent (Akarta) as characterizing the transcendent self - Puruṣa. Īśvara Kṛṣṇa taught that nature - Prakṛti – is a multidimensional formation created by three primary forces or dynamic qualities - Guṇas. In accordance to all Vedic philosophy, Sānkhya Karikas state that there these 3 primary forces – namely – Sattva, Rajas and Tamas underlying all material, including psycho-mental, phenomena. Very shortly they can be described as Sattva being the force leading to the qualities of a saint, intelligence, order, Rajas – the force and qualities leading to activities, duties, unrest, manliness, etc., while Tamas usually is described as a force or sum of qualities as ignorance, inactivity, femininity, inertness, etc. All three Guṇas in their different combinations and manifestations form the manifested reality or Nature - Prakṛti – which doesn’t have a qualified consciousness, at least according to Sānkhya Karikas. The phenomenal nature, which distinguishes things and persons (seen as psycho-physical organisms) is considered to be developed in process of evolution from the primordial state of matter. This concept is based on the theory of causality, known as satkāryavāda, according to which the result already implicitly pre-exists in its cause, before it manifests. According to Sānkhya Karika, Gunas are in the state of equilibrium in the transcendental dimension of the nature, known as Prakṛti, - Pradhāna – Primordial Nature. The original mater (Prakṛti – Pradhāna) is uncaused, eternal, all-pervading, unique, independent, complete in itself and doesn’t have distinct parts. However things that originates or evolutes from this Primordial Principle of Matter – are caused, not eternal, limited, many, gross, dependent and consists of parts. The first products that arise from this original principle of Prakṛti is called mahat – ‘the great’ or ‘the great principle’. It appears as bright and intelligent, also known as buddhi (“intuition”, “knowledge”, “intelligence”). But actually mahat is not conscious itself (like other aspects of nature), and represents only a particularly refined form of matter-energy. For the “light” of intelligence, awareness it depends on the transcendent consciousness or Puruṣa. From mahat or buddhi emerge ahamkara – the principle of individuality, which distinguishes between subject and object. This existential category in turn serves as a cause to appearance of a sensitive mind (manas), the five organs of perception or senses (sight, audition, smell, taste and touch) and the five organs of activity (speech, comprehension, motion, reproduction and excretion). Additionally, five subtle substances (tanmātra), underlying sensory abilities, appears from ahamkara. These (five tanmātras) in turn produce the five gross material elements (bhūtas) – earth, water, fire, air and ether. Thus, the classic Sānkhya philosophy distinguishes twenty-four categories of the material existence. But the countless transcendent selves are kept outside the frames of three Guṇas and their products. All this process of evolution is activated through the presence of the transcendent selves (Puruṣa) in the principle of nature, for a purpose to liberate this higher self from the wrong self-identification with material body-mind, while its intrinsic nature is a pure consciousness. This evolutionary outline can be understood as a cosmic evolution, as logical and transcendental analysis of different factors perceived in experience, as an analysis of the human personality. The goal of Sānkhya philosophy of evolution however is not so much to explain the reality, but to transcend it. Sānkhya philosophy is meant to be seen rather as a practical framework for those seeking liberation and are coming in contact with the different categories of existence in the course of their practice of meditations. Similarly to the theory of dharmas, which later developed Buddha Shakyamuni – it’s not so important if it is truth, but that it helps in the process of liberation. The Sāṁkhya Karika outlines three ways of acquiring knowledge (pramāṇas): perception, inference and verbal testimony. Perception is defined as the application of sense organs to their objects. The inference is not defined and is first divided into three classes and then two. According to the first classification, inference is called purvavat – if it is based on the experiences of the past (like when you see a black cloud and conclude that rain is coming); śeṣavat is called when a conclusion is made based on a presence of a particular quality in a part of object and deducted its presence in other parts (as when there is a drop of salt water and is concluded that all water is salty).It is called samanyatodṛṣṭa when the conclusion is made about invisible things (like the movements of stars is calculated observing their positions in the sky at different time). According to another classification inference can be direct or indirect. The verbal testimony , to make it valid, it must belong to someone of proven competence. 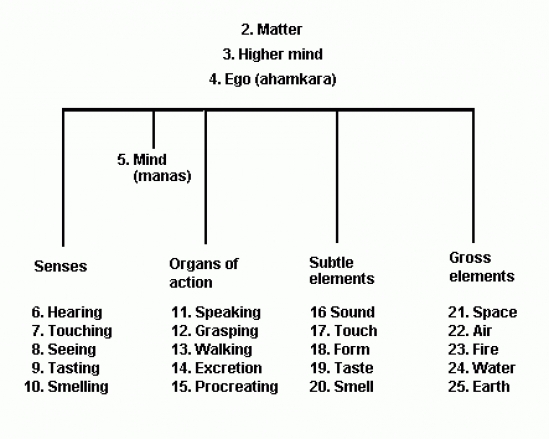 Except of the three forms of knowledge also different forms of organ functioning is considered in Sānkhya Karika. The external senses can only perceive the objects of the present time, while internal senses (manas, buddhi and antaḥkaraṇa ) have the ability to grasp all objects: past, present and future. Sāṁkhya Karika expresses the intellectual approach, characteristic to the Sānkhya tradition. The suffering is due to ignorance of the true nature of the Self, and Liberation, the most precious gift, can be attained through realizing the distinction between the true nature of the Self (Puruṣa) and nature (Prakṛti). In the state of Liberation one becomes indifferent to the nature, ceases to act and enjoy. In the state of Liberation Puruṣa becomes one with a pure consciousness, being a passive witness. This was considered an introduction into Sāṁkhya philosophy, you are encouraged to read also the full text of Sāṁkhya Karika by Īśvara Kṛṣṇa.